Of course, these are the pieces that I would be buying if I had a lottery win...sigh. However I can dream, and in that fantasy I can plan my perfect summer wardrobe which would include all the following! 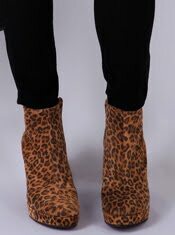 The boots above are the Mentor wedge ones that I am wrestling with my concience/bank balance over buying. I'll keep you posted...! Sequin dress by Thakoon. This is over £1k so shall remain a 'wish' on the lust-list. 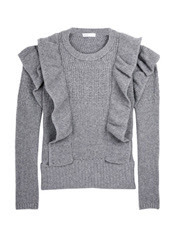 Below is a very cute See By Chloe ruffle jumper. Not the most summery garment but would look awesome with pale beige chino pants and wedges for a summer's evening. I have actually bought a sequin beret, the one below is Patricia Field, I managed to find a pale gold one which is a little bit 'Carrie' (will probably wear it to the SATC2 movie) and a whole lot cute, I love it! 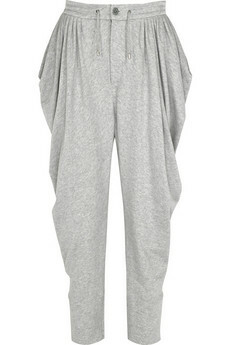 See By Chloe harems...because harems are always, always in order. 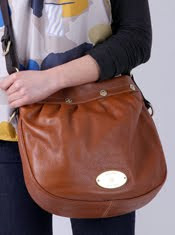 Below: the Mulberry 'Mitzy' satchel. I love Mulberry bags and dream of owning a Bayswater (classic) but I like the utilitarian feel to this one and also the fact that it's a little off-edge for Mulberry, not their usual city-chic style. And I just love it, generally. 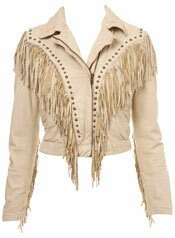 Below: Miss Selfridge cream leather fringed jacket. My friend and fellow fash blogger styleofafashionista.blogspot.com has this exact jacket in black and it's gorgeousss. Also it is £75 in the sale, and since I already have a black leather jacket, this one would be the obvious choice. Those Mentor boots again...I am obsessed. If only they weren't £230! And here: the Kate Moss Topshop suede cutout shorts I was harping on about yesterday. They are £70. But aren't they lovely! And another leather jacket (I do like a leather jacket). 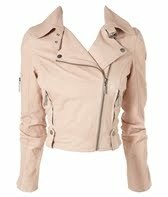 This one's from Lipsy and I like the pale pink shade and harder edged biker styling. 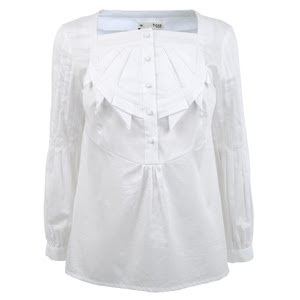 White shirt from Hoss Intropia. Classic piece with a twist...just what I need! And below: Fendi high waist shorts. I like a high waist as I'm petite so like the leverage it gives to my legs. The shade and style of these are bang on, I like that they're a little bit cullotte, a little bit flirty, and a whole lot cute-the blush shade is sooo right now too. So..that's my dream wardrobe for the coming month, though the pay packet won't stretch that far I'm afraid! What's on your radar for high summer? What key pieces will you be buying?